Napoleon III oþre nama Louis-Napoléon Bonaparte (20 Ēastermonaþ 1808 - 9 Æfter Gēola 1873) ƿæs Franclandes oþra and endmesta casere. His fader ƿæs Louis Bonaparte, and þȳ his eam ƿæs Napoleon I Francena Casere. In 1848 flīemede Loðƿic-Philippus Cyning and sēo Frencisce Cyneƿīse begann. Louis-Napoleon ƿeard on 10 Gēolmonaþ 1848 hiere ǣrresta Forsittende. On 2 Gēolmonaþ 1851 tōƿearp he þa Frenciscan Folcgesamnunge and On 2 Gēolmonaþ 1852 nām he his eames cynehelm and þone naman Napoleon III. 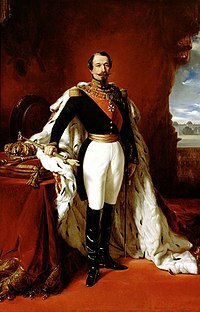 Napoleon III Casere ricsode oþ 1870. On þissum gēarum gestoðolede he þæt Frencisce Landbūnes-rīce, getimbrode Paris nīƿe and ƿyrhtede Francland to þissa ield. In 1870 begann guð mid Prussia and þa Francan fundon þe hiera casere næs his eam; se Germanisca here fōng þone Casere æt Sedan, and nām Paris. Napoleon III endede his dagas on Bryten, sƿa sƿa Loðƿic-Philippus Cyning. Man nīwanost wende þisne tramet on þǣre 04:03 tīde þæs 10 Þrimilcemōnaþ 2018.